DORTMUND, Germany (AP) — Borussia Dortmund guaranteed its spot in the Champions League knockout stage after a 0-0 draw with Club Brugge on Wednesday. 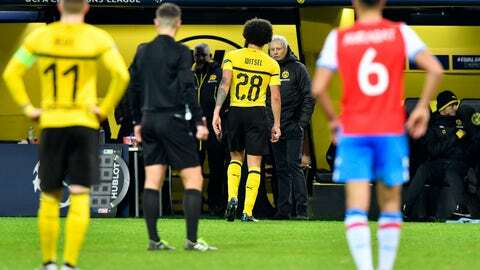 The result left Dortmund second in Group A, two points behind Atletico Madrid — which beat Monaco 2-0 earlier to advance — and five ahead of Brugge, which is assured of third place. Christian Pulisic and Marco Reus missed the best first-half chances for the Bundesliga leader. Pulisic fired straight at goalkeeper Ethan Horvath when he should have scored, while Reus shot just wide with only Horvath to beat after Paco Alcacer sent him though. Brugge was without wide players Arnaut Groeneveld and Thibault Vlietinck, who had caused problems for Dortmund in their opening match, a 1-0 win for the German side on Sept. 18. Without their injured wingers, the visitors concentrated mostly on defending. Dortmund displayed more urgency after the break, albeit without creating any chances as good as the first half’s. “It was a tough game, not a good game from us. We had two huge chances in the first half and it got more difficult to find gaps after that. Individually we weren’t good. But the main thing was to reach the next round,” Dortmund sporting director Michael Zorc said. Emmanuel Dennis went closest for Brugge. Dortmund visits Monaco and Brugge hosts Atletico in the group’s last games on Dec. 11.